The metropolitan area of Washington, D.C., Maryland and Virginia offers travelers numerous places to see, explore and experience. As we celebrate Women’s History Month, consider visiting the establishments of two women who are mothers and entrepreneurs. They are building legacies for their families out of their passions for providing customers with an elegant atmosphere, excellent products, and exceptional service. The first time the owner of Serenity Tea Room & Fine Dining sat down to a traditional afternoon tea, it left her with a feeling she had never experienced before. That was in 1987, many years after she inherited the fine china dining set her grandmother bought for Blanch Henry at the time of her birth. “I believe she had a vision from God of what I was going to be doing for her to purchase that china. She bought a whole eight-person china set,” says the owner of the Serenity Tearoom in Frederick, Maryland. The pursuit of her true purpose came in September of 2005 when she turned the joy of having high tea at a Four Seasons Hotel into a business of her own. “My mission is to provide an elegant, professional afternoon tea and dinner with tasty food, hospitable service and fond memories,” says Henry. The accountant, wife and mother of two knew she wanted to expand her business, so Serenity moved into a larger building on West Patrick Street. With her daughter Tiera and son-in-law Brandon Sumblin on board, the family could put more choices on the lunch and dessert menus. The restaurant also began offering upscale dinners in addition to traditional afternoon tea service. The Sumblins are both graduates of Johnson & Wales University’s College of Culinary Arts. Brandon won a 2016 episode of “Cons vs. Cooks” on the Food Network. He is Serenity’s executive chef and Tiera is the pastry chef and front of the house manager. “At some point, the business is going to be passed on to my children and my son-in-law, who is like one of my children,” says Henry. The restaurant also gets support from Henry’s husband and co-proprietor, Ronnie, an engineer and a pastor. Her older daughter Angelica helps out as well. Together they aim to please clientele with seasonal menus offering appetizers, soups, salads, sandwiches and entrees, 97 percent of which is made from scratch and presented with flavor and flair. Some of the most popular dishes include Blanch’s Crab Dip, Fried Green Tomatoes, Salt & Pepper Catfish, Chicken & Waffles, Southern Shrimp & Grits and Chocolate Decadence. The restaurant does not serve alcohol, but you can bring a bottle of wine. A small corkage fee is charged on Friday and Saturday nights when Serenity brings in live jazz performers to entertain diners. TripAdvisor and Teamap give Serenity Tearoom & Fine Dining five stars. It is located about 50 miles from Washington, D.C. at 162 West Patrick Street and has free parking in the adjacent lot. It is open Tuesday through Saturday for afternoon tea, lunch and dinner. 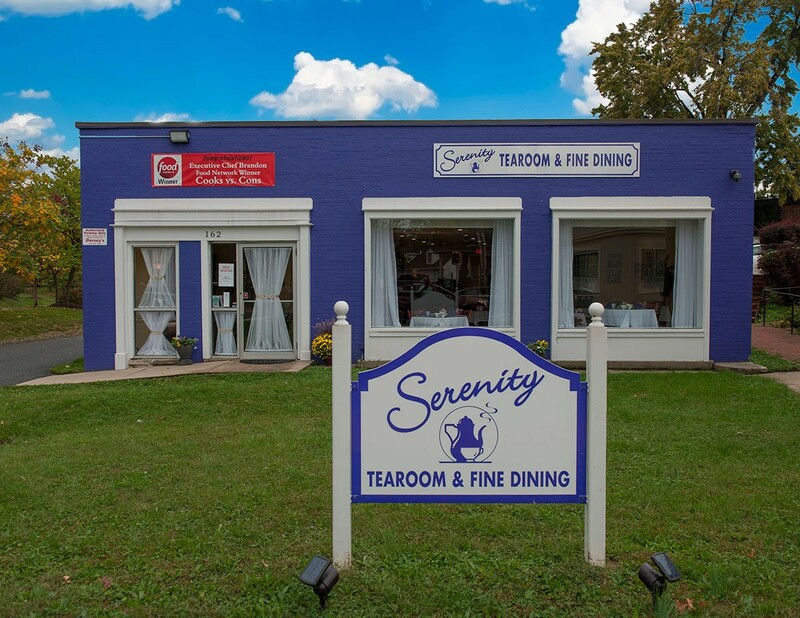 Brunch is served on Saturdays from 9 a.m. to 2 p.m. Visit the website www.serenitytearoom.com or call 301.695.TEAS (8327) for more information. 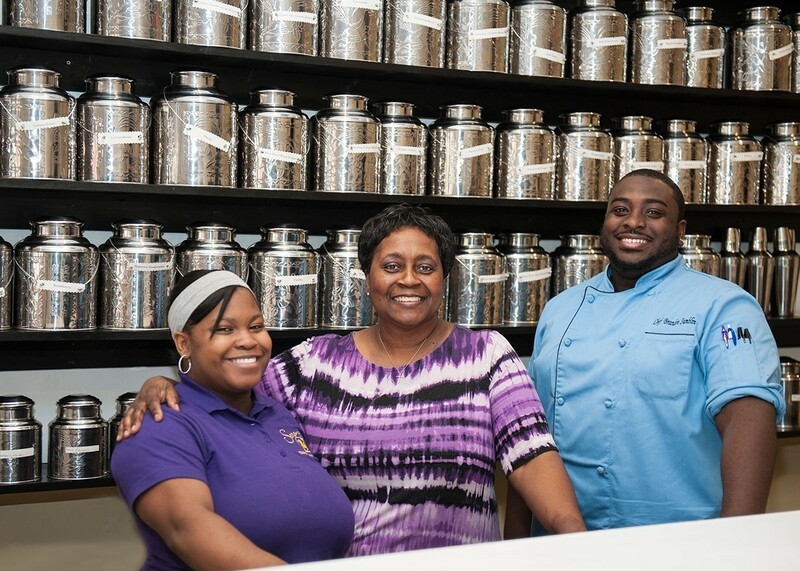 Almost in a single breath, Angel Anderson took the leap from assistant principal to the owner of The Spice Suite in Washington, D.C. She opened the shop in 2015 about three and a half weeks after the idea popped into her head while talking to the owner of retail space in the Takoma Park neighborhood where Anderson grew up with her grandparents. The 31-year-old mother has a 6-year-old son and holds a master’s degree in psychology. She knew exactly the kind of place she wanted to breathe life into with music, vintage decor and incredible aromas. “I call it interactive because when you come into The Spice Suite, all of your senses are engaged,” says Anderson. The spices stocked from around the world are packaged in one-ounce glass bottles that sell for $12 or $13 each. Anderson puts the labels on the lids of the bottles to give customers a clear view of the contents. She encourages browsing and loves helping people find just the right spice or spice blend. “It’s such a fun place to visit. It’s a place that feels good,” says Anderson. Along with the spices, herbs and seasoned olive oils offered, the owner of The Spice Suite supports other small businesses with pop-ups at her shop on Saturdays and Sundays. 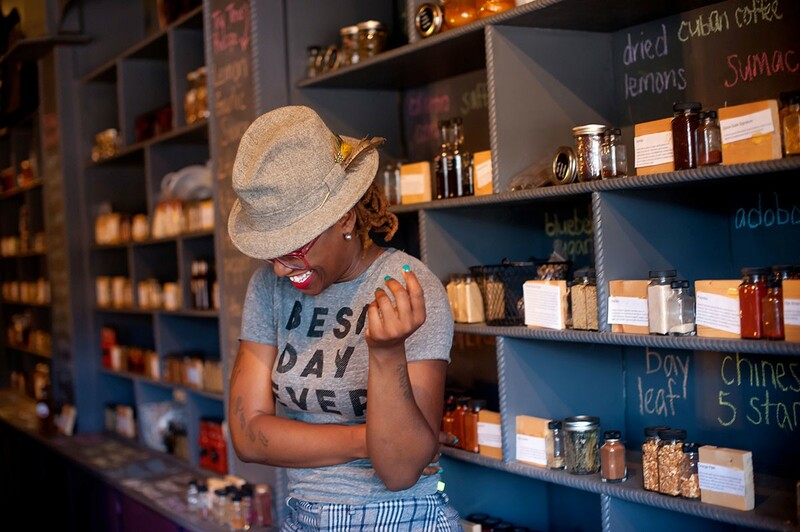 Her clientele can pick up their spices and check out shea butter, handmade jewelry or other products offered by black entrepreneurs. They can also meet yoga instructors, realtors or other business owners. “I love supporting black businesses and it’s my way of paying it forward,” says Anderson. The Spice Suite won Washington City Paper’s Best of D.C. 2016 Reader Poll for spice shops in the DMV. The shop is located at 6902 4th Street, NW and is open Thursday through Sunday from 12 to 6 p.m. You can also order online www.thespicesuite.com or call 202.506.3436. The joy of cooking became a part of her life when Phyllis was a child learning her way around the kitchen with her mother and grandmother. 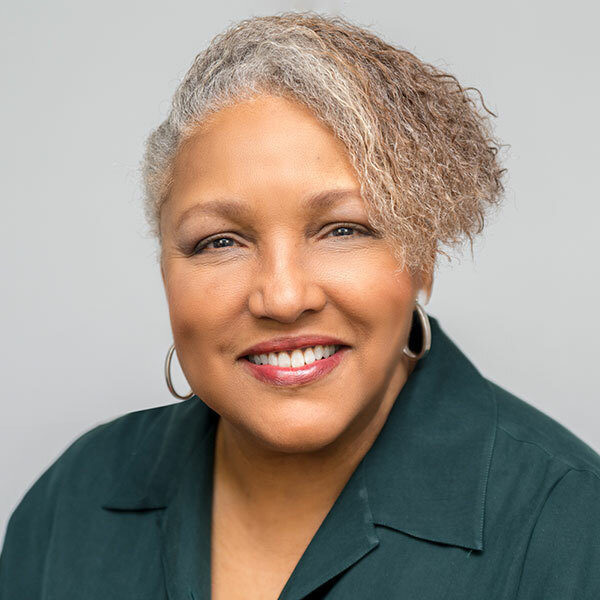 Her retirement from a demanding career in broadcast news has given her time to write about African-American chefs and restaurant owners as well as other black professionals succeeding in the travel and wine industries. Phyllis still loves to cook and try out new recipes.